Sunday morning, I came downstairs and sort of half-heartedly flipped on the TV. The show I wanted to watch was still a good 18 minutes away, but sometimes it helps in our house to stake the claim in advance. As it happened, my partner must have been watching one of those Bill Engvall-hosted, hey-y’all-check-out-them-rednecks reality shows the night before, and the TV was still tuned to CMT, which – amazing these days, given the “M” in its initials – was actually playing a music video. Blame it on Sunday morning inertia: I didn’t rush to change the channel. But then, after a minute or so of doing nothing in particular – oh, look at the fog out there, it’s gonna be a muggy day, I thought absently to myself while surveying the progress of my garden – I found myself nodding and humming along to the tune they were playing on the TV. In the song’s video, Niemann comes off as a paragon of unspectacular manhood and charmingly impish macho – he’s not going to stick around for further neglect, but he’s not going to get all tear-in-his-beer about it either. Instead – so the video goes – he’ll just sit out on the front steps, looking not-so-bad in blue jeans and a t-shirt, strumming his guitar, singing his song, and, y’know, inviting (or rather, enlisting some of the neighbor kids to put up handwritten posters inviting) passers-by to gut the apartment of all of his corporate career-woman girlfriend’s prized possessions. (Don’t try this on Craigslist!) I’m sure there’s a retrograde comment on the evolution of traditional gender roles in there somewhere, but… shoot, do you hear that bass voice in the harmonies? Kansas-native Niemann has been making a decent living as a songwriter for the last half-decade or so (although he didn’t write “Lover, Lover” – it’s a Sonia Dada cover), scoring his biggest hit when Garth Brooks recorded “Good Ride Cowboy”, and recording a couple of self-released records along the way. Last year, he became the first artist signed to Brad Paisley‘s new label Sea Gayle Records, and started work on his major label debut Judge Jerrod and the Hung Jury. While citing such old-school country stars as Eddy Arnold, Lefty Frizzell, and George Strait as influences, Niemann doesn’t seem to belabor the typical country image too much. He eschews the traditional cowboy hat for something a little more train conductor. He may be a-pickin’-and-a-grinnin’, but not on a hay bail against a Hee-Haw blue sky backdrop; rather on the front stoop of his building in the shadow of a big city skyline. “Lover, Lover” is a great little song that’s already a Top 20 country hit, but with its effortless, just-this-side-of-gimmicky, Uncle Kracker-ish chorus – the song’s strongest but also most artistically suspect asset – it’s making its way up the Billboard Hot 100 as well. 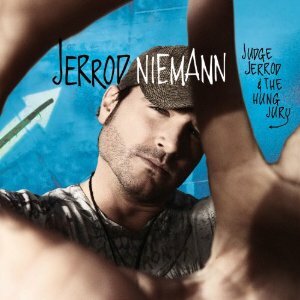 Judge Jerrod and the Hung Jury is set for a July 13 release and is currently available for pre-order. Copyright 2007-2015 by Silver Beacon Marketing, Inc.